Son In Law Eggs, or ‘khai luuk kheuy’ is a salad made from deep-fried hard boiled eggs, which have been cut into halves or quarters, and topped with a sour & sweet tamarind sauce and fried shallots. I’ve heard many stories as to the origin of this dish’s name… but they all conflict. I’ll ask around here in Thailand and see if I can get the real story and get back to you. Boil the eggs: put the eggs in cold/room temp water on the stove, and make sure they are at least 1″ under the surface of the water. Bring to boil and boil for 7 minutes on medium-high. Don’t do a rolling boil, or the shells will crack. When finished, switch the water with cool water and leave for a few minutes to cool down. When cooled, peel and set aside for frying. While the eggs are boiling, you can start with the rest of the steps. First is to dry-roast the chilies. Take the chilies and put them in a pan on medium-high and toss every few seconds. The air might get a bit spicy so make sure you have a window open or a fan on or something. Brown on each side and set aside. Now you can make the sauce. Start by creating the tamarind paste out of the tamarind and hot water. Squeeze it in a small bowl with your fingers until you’re left with a paste and seeds/fibers. Remove the seeds/fibers and then strain the rest to get rid of the bits. Add to a sauce pan. Heat on low until warm, and add the palm sugar and fish sauce. The palm sugar will melt in the heat. Cook until it’s melted and mixed well, and then simmer on low for about 5 minutes until darker brown. Set aside. Frying time! In a wok add about 2 tablespoons of oil, and heat to high. Drop in the shallots and stir constantly (don’t stop even for a second or they will burn!) until lightly browned. Strain and remove. Add a tablespoon more of oil, lower your heat to medium/high, and add your eggs. The recipe is for ‘deep fried’ eggs, but actually you don’t need to waste your oil to submerge them. Just keep turning the eggs so they evenly brown all over. When golden brown, strain and set aside. Cut your eggs into quarters or halves, and arrange on a plate. 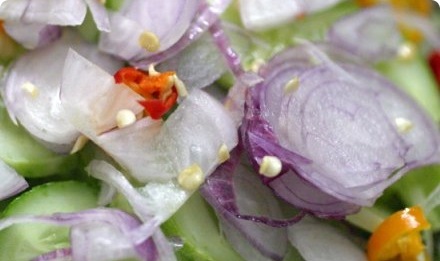 Drizzle the sauce on top, and top with the fried shallots, roasted chilies and fresh coriander. thanks for the nice recipes, but sometimes hard to find the right ingredients such as maca-root, the peanut eggplants. I wish i can have all the ingredients that you mention. then i can make all the recipes you post here. If you cannot find the ingredients at your local Asian grocery, and live in the US, you can order online from Import Food. They’ll deliver all sorts of Thai ingredients, even fresh items to your door. I wanted to create authentic Thai recipes, using the ingredients that Thai people use here in Thailand. If you’d like to substitute items, you’re welcome to, but the recipe I provide uses the authentic vegetable/herb/etc. PS: I’m not sure what ‘maca-root’ is! This is the first site that I saw son in law eggs! My mom who is from Thailand used to make these and I loved them! This is my all time favorite potluck contribution. People are always amazed by deep fried hard boiled eggs and then get transported to heaven when they eat them with the sauce. 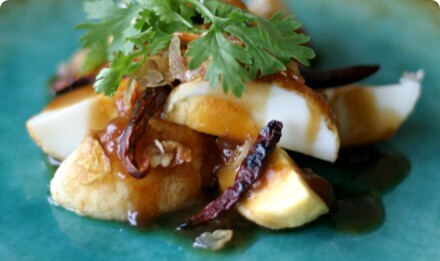 One of the most amazing Thai recipes, with wonderful contrasts of flavors and textures. BTW, the sauce is wonderful on steamed fish as well – check it out. I was always told this dish was made for the new son-in-law as a warning. In case he had any ideas of hurting his new bride, his “eggs” could end up the same as in this dish. This dish is simple and amazing. The sweet and sour notes combined with the crispy textures make a party in your mouth. It’s sweet, savory, spicy and delicious. I used six eggs and there was plenty of sauce for all of them. My friend and I were both surprised and impressed. Give it a try! easy way to stop boiled eggs cracking during boiling. Work out which end is the most round and make a small hole in it. (I use the end of a cork screw but a paring knife works well -expect to crack a couple until you are used to it). It works because there is an air gap inside the egg with a small membrane. I am definitely going to make this dish -it sounds yummy. I would like to know if v can add honey as a substitute instead of palm sugar. Hi … just thought I’d add my three ha’pence worth. Having cooked all my life and now finding myself living in Thailand, I’m gradually working my way through making all of my favourite Thai dishes. I gave khai luuk kheuy a go tonight, and as usual, I have a trawl through the Internet before starting and more often than not find myself on this site (or one or two others), just to check I’m on the right track, recipe-wise. Pretty much all Thai dishes are fairly simple to prepare (it may help if your local Tesco has all the ingredients :-), so I just adjust recipes according to my taste and what I like eating here. All I changed in your recipe was adding more nam pla to the sauce (I added 3 tbsp). It actually makes it taste even sweeter. However, just as I was finishing the wife and sister-in-law starting screaming at me (well, almost). The problem was the coriander. Apparently it’s a very, very big “NO! NO!” on khai luuk kheuy. Can’t remember having it with it here … but then, I can’t remember not having it with coriander either. Anyway, two Lanna girls want to say: “Nooooooooo!!!!!! !” to coriander on this dish. 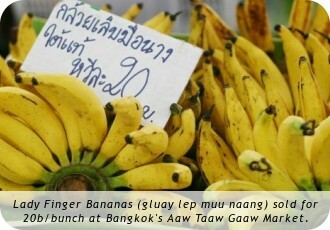 I’m curious to know if you see it in restaurants in Lanna – and if not, what they garnish it with up there. Thanks for the three ha’pence input – it’s much appreciated.